The movie projector was first invented in the 1890's. Early film devices were created by inventors all over the world. The most significant inventions were made by the French Lumiere brothers and Thomas Edison. 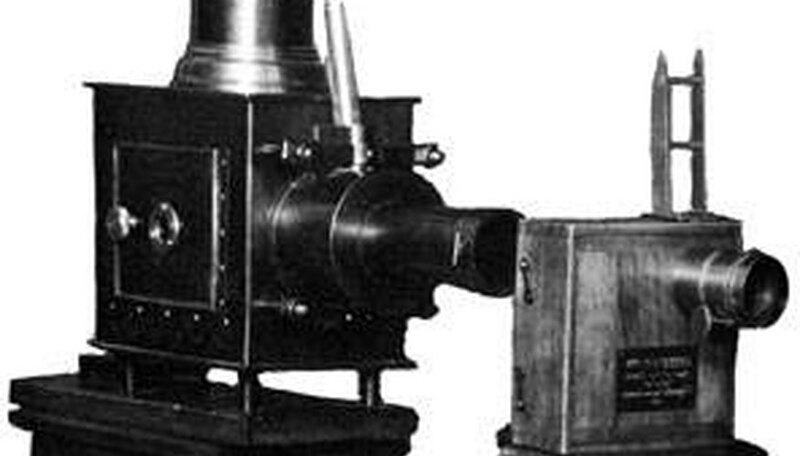 Several movie projection devices were invented from the 1890's to the early 1900's. Some of the early movie projectors were called cinematographs, kinetoscopes, and the vitascope. A movie projector is a device that projects frames from a reel of film. This creates a moving picture that is projected onto a screen. Projectors have four components including the lamp, spool, lens, and audio. The Lumiere brothers are credited to be the first inventors of the movie projector. They worked for their father's photography firm, and began to make improvements to the still-photograph process. When their father retired in 1892, the Lumiere brothers began to create moving pictures. They patented the cinematographe in 1895 and showed the first ever recorded footage. The footage showed workers leaving the Lumiere factory. The cinematographe was a film camera, or projector. It could process film, take photos, and project the film all in one device. The cinemotographe was portable and was used to film short sequences. Cinematographe films were only a few seconds long. Thomas Edison introduced the first moving picture camera in 1893. The kinetograph had a cabinet that held a continuous loop of celluloid film. It was powered by an electric motor and backlit by an incandescent lamp. The moving picture was viewed through an eye piece. Kinetoscope parlors became popular around the world and showed images of acrobats, music performers, and boxing. In 1896 the vitascope was invented. It was a film projection system that large audiences could watch. The vitascope was invented by Thomas Armat and C. Francis Jenkins. The vitascope was marketed by the Edison Manufacturing Company. In 1896 The Edison Company stopped marketing the vitascope in favor of a new invention, the projectoscope (projecting kinetoscope). What Is the Difference Between 35mm & 70mm Film?